Five Kent teenagers are taking part in the Tall Ships Race, sailing from Chatham to Denmark. 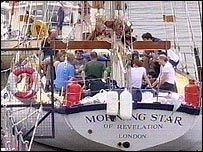 They have been given bursaries so they can join the crew of the Morning Star - a 62ft yacht run by the Morning Star Trust, a youth sailing organisation. Team members will crew the boat, put up sails, clean up and take turns at the helm - in Denmark a second crew will take over and sail on to Norway. The Morning Star Trust is based in the historic dockyard at Chatham. General manager of the trust, Nick Gainsford, said the trip would not be a holiday. "They will be fully engaged from the moment they step aboard in all that it takes to sail and run this ocean-going vessel. "This year they will be starting in Chatham to sail to Antwerp and from there they will sail up to Denmark. "From there they will hand over to another crew who will sail to Norway, before returning to Germany.